Many people look forward to celebrating America's birthday on Independence Day. Celebrate outdoors with friends and family by planning a 4th of July pool party for everyone. Make sure your pool party on the 4th goes off without a hitch by making initial arrangements early. Your main location choices are throwing the party at a private backyard swimming pool or renting out a public pool venue, such as the local community pool or a hotel pool. Once you've decided on the pool venue, reserve the space early. Public venues can be booked weeks or even months in advance of this outdoor holiday. The party doesn't necessarily have to fall on the 4th. If the 4th of July is on a Monday, you could have your party on Sunday, the 3rd. This may be a good idea if the pool party will go late into the night. If your party will be a daytime-only event, it makes sense to host it on the 4th. Create your guest list carefully. Think about how many people your backyard or rented venue can hold, as well as how many supplies, such as food and drinks, you can afford to provide. 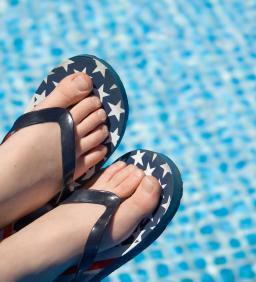 Even if someone doesn't swim, you may still want to include them in your pool party fun on the 4th. Pick out 4th of July party invitations and remember to include all the details - party address, hours and dress code. If you want people to dress for a luau, say so in the invitation. If you want guests to bring a food item or beverages, state this in the invitation as well. Most people generally make their holiday plans weeks or months in advance, so send out your invitations at least a month before the event. Be sure to request RSVPs, so you have a headcount and know how much food to buy. If the pool party is for children or there will be many kids attending with their parents, consider hiring a private lifeguard for your event. It's better to be overly cautious than to have an accident happen. Call your local YMCA or community pool to find a lifeguard to hire. Search the Internet for local private lifeguard services, as well. For example, Happy Swimmers USA provides links to local lifeguards for hire in many areas of the U.S. You'll typically need to reserve your private lifeguard a minimum of two weeks before your event, but play it safe and book it in May to ensure your July event is covered. Figure out a special theme and plan some great games, which are the fun parts of planning a 4th of July pool party. All-American: Plan an All-American pool party, complete with American flags, stars and stripes decorations and apple pie. 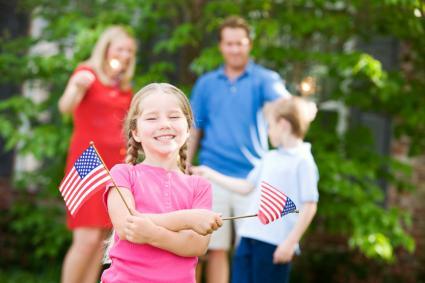 Use red, white and blue decorations and play patriotic music in the background. Make 4th of July party foods in a picnic or barbecue theme. Picnic foods include lemonade, fried chicken, potato salad and strawberry pie. Barbecue foods include ribs or grilled chicken, corn on the cob and homemade vanilla ice cream. Fireworks: Buy sparklers to hand out to guests when the sun sets. This type of theme party is ideal if you can actually set off fireworks on your property - if you live out of the city limits. It can also be ideal if you can view the local fireworks show from your backyard or the party venue. Good decorations for this theme are gold and silver glitter sparkler table centerpieces along with American flags. Light up the charcoal or propane grill and serve beer and iced tea, as well as hamburgers and hot dogs or steak and shrimp. End the evening with a flamed dessert, such as crème brulee or a baked Alaska. Luau: You may be interested in a luau theme for an adult pool party, complete with Mai Tais or rum punch. Decorate the pool area with tiki torches, surfboards, palm trees and fish. Pass out leis and grass skirts to the guests. Serve roasted pork, fish and fruit, including pineapples. Play hula music and plan hula dancing and limbo contests. Cape Cod: Bring the east coast to your pool party with a Cape Cod theme. Decorate with blue and white striped tablecloths and lighthouses. Hang fishing nets with plastic lobsters and shells on the fence and string tiny white lights around the patio. Serve clambake-type foods, such as steamed or boiled lobsters, potatoes, corn and clam chowder. Once you've chosen your pool party theme, you can find appropriate decorations at your local party supply store or online at places like Party City. There are many different games that are perfect for a pool party. Adults and kids alike are familiar with Marco Polo. Adults may enjoy water volleyball, while kids can play competitive games, such as cannonball jumps or relay races. Make sure your guests are safe to ensure everyone has a great time. Never mix alcohol and swimming. If you are allowed to set off your own fireworks, make sure you take all precautions to prevent accidents. For example, have a fire extinguisher and water hose ready to go, and don't let children near the firing-off location. The 4th of July is the perfect time for friends and loved ones to get together to celebrate freedom. Pool parties are quintessential summertime events. By following a plan for your party, it is sure to be a hit.